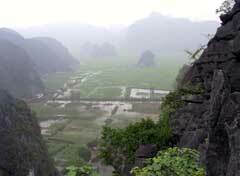 The town of Ninh Binh is the place to stay if you wish to visit one of the neaby national parks. Tam Coc and Hoa Lu are both about 10km away. 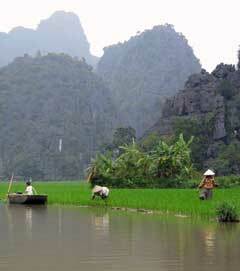 Cuc Phuong national park is also within easy reach at around 45km from Ninh Binh. Ninh Binh is 95km south-west of Hanoi and is easily reached by bus from Hanoi's southern bus terminal (journey takes about 2½ hours). You can also book a seat on one of the many tour buses that run from Hanoi. Most travel agents and hotels will be able to arrange a ticket. Ninh Binh is also a stopping point for the Hanoi to Ho Chi Minh City express. Below is a list of hotels in Ninh Binh sorted by price range (highest first). If you wish to telephone a hotel the area code for Ninh Binh is 030 (+8430 from outside Vietnam).